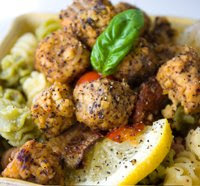 Zesty Lemon Tempeh-tations from Lightlife. My Review. Tempeh-tations: Must try! 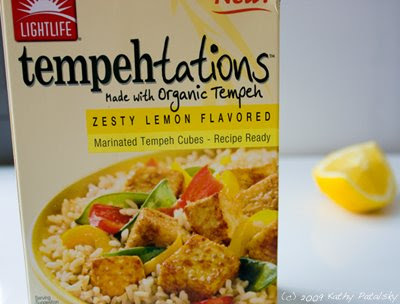 For the past week, almost every night I've added Zesty Lemon Tempeh-tations organic marinated tempeh cubes to my dinner menu. I even served them at Easter dinner. I have not found a vegan protein product that I love this much since my Trader Joe's Soy Nuggets obsession back in college. And that was intense! *24 grams of protein per box. *6 grams of fiber per serving. *8% RDA of potassium & iron per serving. Shelf Appeal: Nice packaging. I love the vacuum sealed plastic bag that the cubes come in. Super fresh. And the pic on the box is actually what they look like when sauteed. Label Check: Healthy. Protein packed. 24 grams of protein per box. Two servings per box. 160 calories. 8 g fat. 1 g saturated fat. 6 g fiber. 95 mg sodium (4% RDA). That's quite low sodium for a pre-packages and seasoned food product. Most frozen protein products have around 20% RDA sodium. Calcium is 6% RDA and 8% iron. Again, these are per serving and there are two servings per box. The only small quip I'd note is that I see corn syrup on the label. However, it is the LAST ingredient and since there is only 1 g of sugar, I guess the amount used is VERY tiny. Oh, and these yummy bits are organic. Yes! Taste Test: Well, I don't want to annoy you with my raving review, but I can't help it. I love these little cubes! So easy and fast to make and they taste much better than any tempeh marinade I could whip up in 5 minutes. I like to saute them with a few veggies, onion, lemon juice, a drizzle of olive oil and pepper. So awesome. I've even added a few spoonfuls of chili peppers and they get spicy! Served over pasta, salad or rice these cubes are delish. Not too hard, not too mushy, they saute up just right. I don't eat these, I Mmmmmm them. Price Check: $3.99 at my Whole Foods Market. Considering my husband's fillet of fish is $5-$8 and that's just one serving of protein, I'd say my two serving protein ingredient in my vegan meal is a heck of a deal. Prices may vary where you are. Last Word: Am I out?! Darn, gotta run to Whole Foods again.